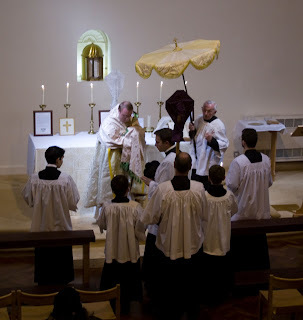 Images from Holy Thursday: The procession to the Altar of Repose, and the Altar of Repose itself. 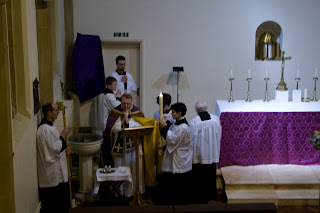 Below, images from the Easter Vigil: blessing the new fire, blessing the holy water in the font, the Consecration. 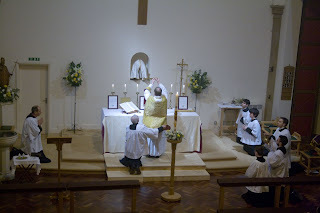 Fr Benjamin Durham FSSP celebrated, assisted by the FSSP seminarian Marek Grabowski. 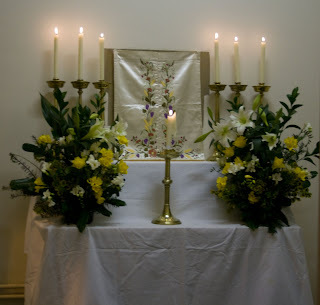 The success of the Triduum owes much to the work Ann de Cruz of the Reading Latin Mass Community, MC Edward Stratton and the leader of the schola, Martin Martinez.